Oil-Electric: What the heck was that? In 1964, I had purchased my first motor vehicle. 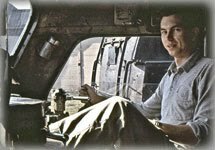 My Airman 3rd Class luxury car. A 1956 Chrysler New Yorker 2 door hard top, with power bench seat, power antenna, and a power steering pump that leaked like a sieve. I purchased aluminum meat loaf pans, and wired one under the pump. When I went around a corner, if a puff of smoke came out of the engine hood, I knew the pan was full of power steering fluid. I would pull over and drain the pan back into the reservoir. I tolerated this condition until I finally had enough money to replace the pump! But, I digress. I soon learned that a guy with a car suddenly has a lot of friends! One Friday night some guy shows up at my room and says he’ll pay the bridge tolls (Golden Gate) AND buy me a tank of gas if only I’ll take him to Bakersfield to see his girl friend – right now! Well, I grabbed my camera, and away we went, just after midnight. It was a long drive, but young men are invincible, and I relished the opportunity to see some new territory. I dropped him off at his girl friends house, and journeyed back to Hamilton. 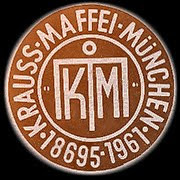 It was later, after picking up a copy of the “Diesel Spotter’s Guide” that I learned I had bagged Krauss-Maffei, A.G. ML-4000 diesel hydraulic locomotive. Two roads experimented with these locomotives, the Denver and Rio Grande Western and the Southern Pacific. The first batch delivered in 1961 D&RGW 4001 to 4003, and SP 9000 to 9002, featured two sets of Maybach V-12, 1,770hp engines driving a hydraulic transmission, one set up for each boggy. Many rosters list these units as 4,000 hp, but the difference between the ways the German manufacturers rated a motor and the way we rated them, US horsepower was de-rated to 3,540 hp. 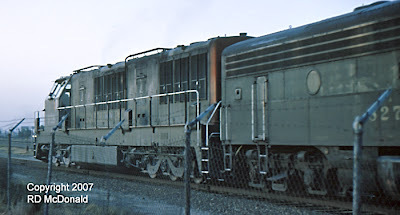 The first batch were “turret” cabs, as in shown below with SP 9014, shot in Oakland, July 3, 1966. 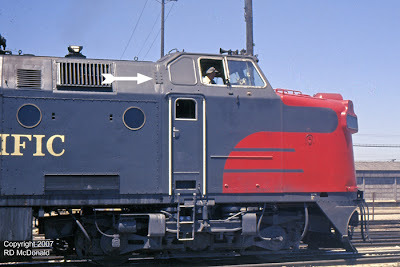 As an aside, notice the gusset plate - arrow above - holding the cab to the locomotive body! Raymond Loewy would roll over in his grave to see this design. Diesel-hydraulic locomotives use a hydraulic transmission to convey the power from the diesel engine to the wheels. On this type of locomotive, the power is transmitted to the wheels by means of a device called a torque converter. A torque converter consists of three main parts, two of which rotate, and one that is fixed. All three main parts are sealed in an oil-filled housing. The inner rotating part of a torque converter is called a "centrifugal pump," the outer part is called a "turbine wheel" and between them is a fixed guide wheel. All of these parts have specially shaped blades to control the flow of oil. The centrifugal pump is connected directly to the diesel engine, and the turbine wheel is connected to an axle, which drives the wheels. As the diesel engine rotates the centrifugal pump, oil is forced outwards at high pressure. The oil is forced through the blades of the fixed guide wheel and then through the blades of the turbine wheel, which causes it to rotate and thus turn the axle and the wheels. The oil is then pumped around the circuit repeatedly. The disposition of the guide vanes allows the torque converter to act as a gearbox with continuously variable ratio. If the output shaft is loaded to reduce its rotational speed, the torque applied to the shaft increases, so the power transmitted by the torque converter remains more or less constant. Alco built a series of three diesel-hydraulics’, Model DH643. Indeed the diesel-hydraulic is very popular in the UK, Europe and other areas. But somehow, these units just didn’t fit in; some say they were maintenance intensive. Who knows? You can read detailed operating instructions, including locomotive schematic layout contained in the Engineer’s Operating Instructions. 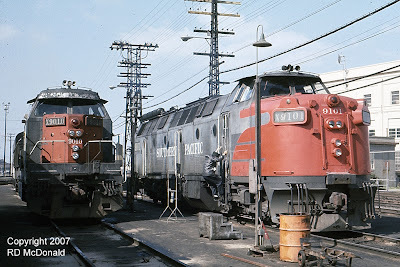 So, the D&RGW dumped their units on the Southern Pacific in 1964, the 4001-4003 becoming SP 9021-9023. Southern Pacific gave them a good try and I was lucky enough to capture these two units, representing the turret cab (SP 9101) and the road switcher cab (SP 9010) in Oakland, in April 1966. Good thing I got them when I did, because they were scrapped in ’67 and ’68! Well, that’s not quite the end of the KM Story. SP 9010 was converted to a camera car in 1968. Here are photos, and a full description of what a “camera car” is – very interesting! 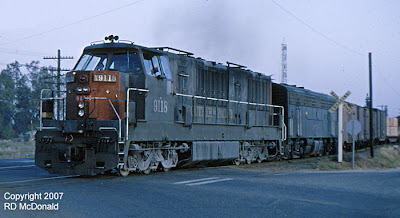 Railroad Stuff: SP 9118, 9101, 9010: Krauss-Maffei ML4000, built in Munich 6/61 shipped to Galveston. Retired and scrapped, 1967 except as noted above. See also: Krauss-Maffei Camera Car. The KM unit #9010 is currently being restored to close to original as built condition by the Pacific Locomotive Association in Niles, CA. They would very much like the pictures you took of their locomotive. I understand that the K-M units were intended for use on the Roseville-Sparks segment, but the many tunnels caused "air starvation" for the diesel engines. The German diesels moved much more air through the engines than U.S. built locomotives (in part, that contributed to their higher HP ratings). SP gave them a good try, but in the end the economics were not favorable.